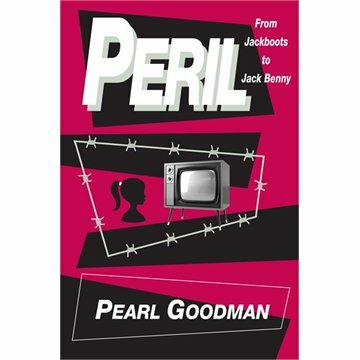 On today’s show I interview Pearl Goodman who has written Peril: From Jack Boots to Jack Benny. In 300 pages, Pearl gives us portraits and vignettes of what it was like growing up in the nineteen-sixties and seventies. This was a time when many holocaust survivors had ended up in cities like Toronto putting geographical if not psychic distance between them and the horrors of World War II. Everything about her childhood is coated, clouded and influenced by her parents’ experience during the war and after. Her parents were survivors of the Nazi’s attempt to exterminate the European Jews. The remainder of their lives was infused with this terrible knowledge, the death, the suffering of entire family members, friends, neighbors and many others left behind. As we roll ever closer to the 70th anniversary of the end of World War II, the numbers of survivors who can still remember and tell us anything of those times are dwindling to a precious few. All the stories we can find, first-hand, must be sought out, recorded and shared. And those who can relay much of those untold stories and insights, as the survivors of World War II pass on, do so as translators, interpreters and paraphrasers of the original tellings. Ms. Goodman and other children of survivors must speak for them because they no longer can. It is said often that we are doomed to repeat history if we do not learn from it. Indeed, genocide has been attempted and succeeded many times to greater and lesser degrees before that war and after. And Jews throughout history have been no stranger to attempts to being eradicated and removed from everywhere we have ever called home. We see the story of the holocaust repeated over and over again in small and big ways in the modern era in such places as: Cambodia, Rwanda, Sri Lanka, The Congo, and Pakistan. In that sense, Ms. Goodman is not just telling her parents story and her own, but the story of all survivors and immigrants trying to overcome the persecution and oppression of their birth country. Join me in my conversation with the author, on a pleasant spring evening in a local restaurant on the very street that Pearl grew up on.